Of all the parts of your home, the roof is one of the most important parts. You can survive without electricity, hot water, windows, doors, even walls and floorboards; but without a roof, your house is a sitting duck for the weather elements. 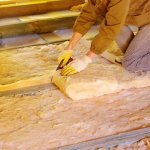 It protects you and your home against sunlight, rain, hail, snow and wind – it is why even survival shelters always start with the roof when detailing how to construct one. That said, there are a lot of myths regarding roof repair. Here are a few of the most popular myths, debunked. Some building codes state that this approach to roofing repair is acceptable. It might be legally “OK,” but it is not wise. If old shingles and roofing structures are not removed, there is no way to inspect them for more significant damage, which can mean the new roofing materials are exposed to the same destructive forces that damaged the old roof. Not removing shingles can also hide damage to the sub-roof. Shingles have been manufactured to specific criteria or attributes. All are rated for durability and some come with lifetime warranties (based on their annual duration rating). Some are made to address specific issues, like moisture, humidity, wind, snow, ice, algae, mold or prolonged exposure to heat from the sun. Others are designed to look like other material, like wood or slate shingles. Some types of shingles are treated to serve as algaecides when exposed to water. Flashing is designed to protect vents, piping, chimneys and other openings in a roof. The assumption is that because it is metal, it can withstand anything. This simply is not true. 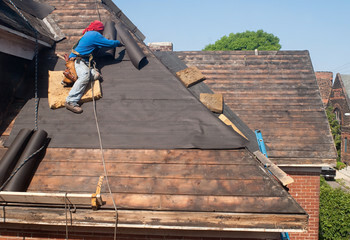 Flashing is susceptible to wind, time and erosion. It can be distorted or moved if put under stress. Stress can be snow or ice, wind or even a house settling. You simply do not know when flashing will become gauged, ripped or even just wear out. Because of that, you need to replace flashing, at least the flashing that is impacted by a needed roof repair, every time you have work done on your roof. This way, you can be assured that your flashing will stand up to whatever Mother Nature throws at it. You definitely should give an “eyeball inspection” after your roof is exposed to any major weather. Apart from that, you should have a professional give your roof an annual inspection, even if it is only to affirm that you need nothing done. If where you are located has harsh weather, either by chance or seasonal, you may need an inspection more than once a year. A good time for that is after summer and winter. 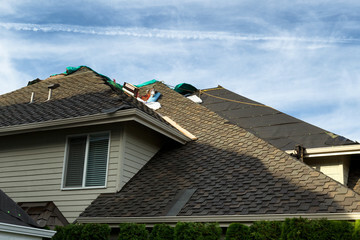 Your roof bears the brunt of the weather elements more than any other part of your house. 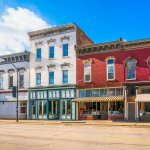 Making sure you do not fall for these myths is key to ensuring your roof serves you well for years to come.